I’m over at the Picket Fence Studios blog and wanted to share here too. 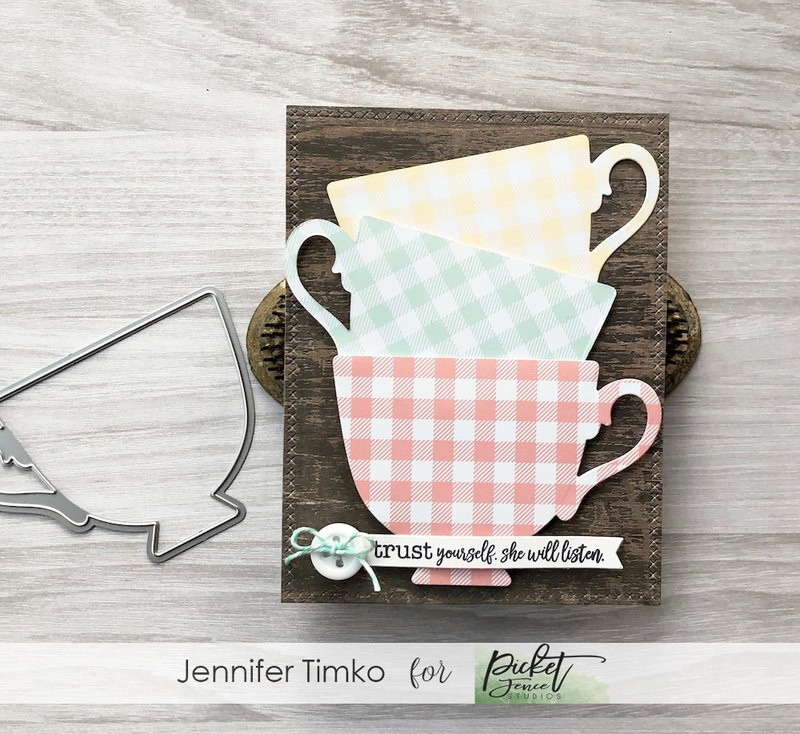 When I was creating today’s card, I was completely enamored with the new Petite Cup Die and wanted to focus squarely on that. I love a stand alone die that can be great for so many kinds of cards. 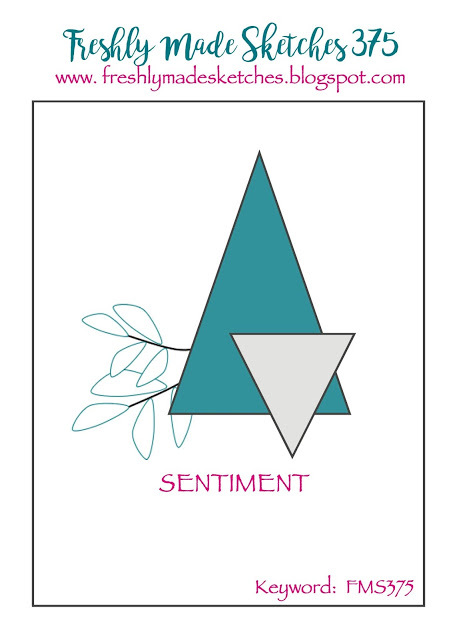 For today, I created a card to support and cheer on a friend. I started with a stack of printed papers in varied colors and used the die to cut out the cups. On the middle cup, I simply cut it on the reverse so I could stack them better. 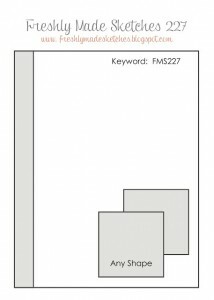 Super fast and think of all the papers you have that would be great for this! To make the gingham cups pop against the background, I chose a woodgrain paper that added texture but also help highlight the fun designs. For a sentiment, I went to the fantastic Exhale Worry stamp set. Seriously, this is one you simply must have. It will be a workhorse for you. I put the sentiment on a little banner and added a button and some twine from my stash. I hope you enjoy this card! Don’t forget to look at your die cuts for fun and inspiration. There are so many ways to use them!! Thanks for stopping in today. See you soon. 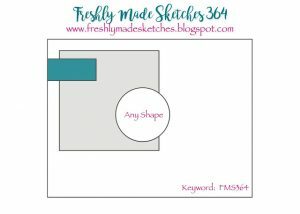 Glad you are here to visit today as I share the latest from Freshly Made Sketches. The always brilliant Cécile has created a unique and wonderful sketch for us this week. Such fun when you get to stretch your brain with something truly new. I will admit that those triangles had me a bit confounded at first so I reverted to another shape. Circles! 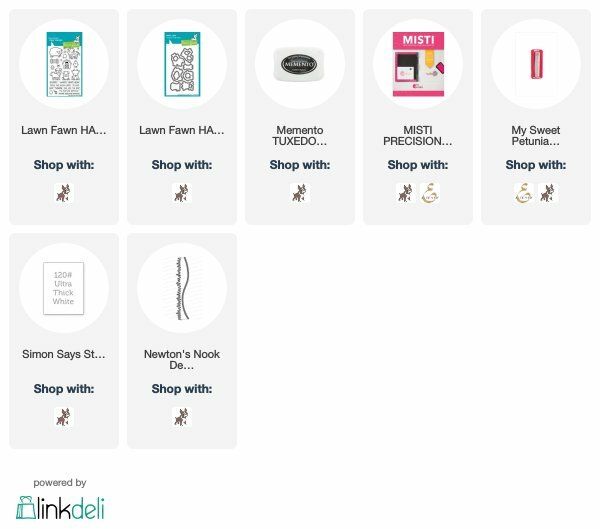 You’d think I’d have had my fill of those last week but nope. So I pondered what stamp set to use and how to make this work. And I came across this Hey There set by Lawn Fawn that had gone uninked….how is that even a thing?! Every image in this set is totally adorable. 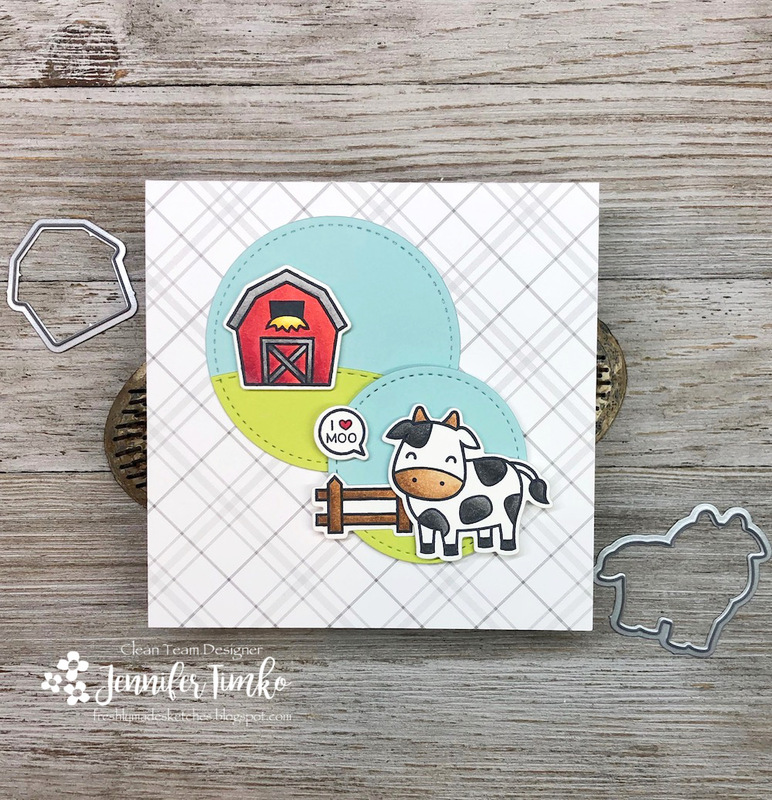 I stamped the barn, the cow and the fence (in my brain this would be the leaf element) and of course the speech bubble. Because why shouldn’t a cow send Valentine’s sentiments? I colored them with my Copics and started playing with the layout. Originally I started with no background shapes at all but quickly found that not to work. So I cut a landscape border for “grass” and then cut it out with a circle die (and cut whole circles from blue card stock while I was at it). That worked much better! It seemed for me that a square card worked better so I cut a square from some Lawn Fawn plaid and then layered my elements. I kind of love this quirky cow card and DH will surely chuckle. He thinks cows are hilarious so I think he will like it. I’m back in FL this week to work on my mom’s house….so off I go back to organizing. I hope your day is wonderful! 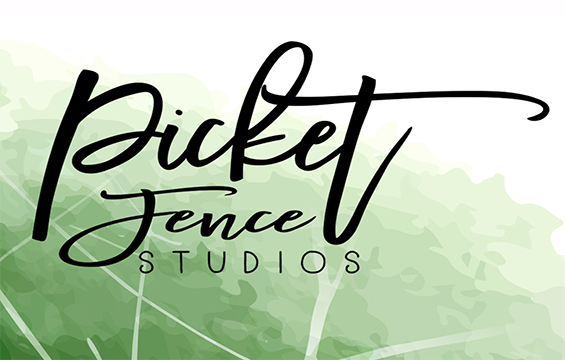 See you tomorrow with the latest release info from Picket Fence Studios! I hope that this finds you having a great week! Here today with the latest from Freshly Made Sketches. 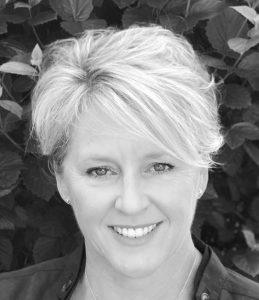 Our host this week is the extraordinary Karren Johnson…one of my coloring idols! She has created a sketch that is sure to be a go-to!! I thought I’d take a little twist on it and create a split card with this cute Gotta Have Gingham paper (Lawn Fawn) and popped it up leaving the sentiment section recessed. I had this little lion left over from coloring for last week’s FMS card and knew he’d be perfect for the sketch. Could not let an image this cute get lost in the pile of “to be used” stuff. He is from the Jungle Littles set (Hello Bluebird) and I just him for a baby card! I found just the right sentiment in a set from Winnie and Walter that I got at Stamping Away called Sketchy Thoughts…it is one of those you’ll see a lot from me because the sentiments are really fantastic, really usable and perfectly sized! I added on a little bit of twine and called this one complete. I have just the recipient in mind for this one…I’m going to be a great-Aunt in the fall and I’m so excited for my niece and her husband!! As always, the design team over at FMS has outdone themselves!! So many fun interpretations of the sketch. I hope to see you in the gallery this week! Thanks for stopping in. See you soon! Today is my day to share a project on the Newton’s Nook Designs Blog. While my blog was plugging along with pre-scheduled posts last week, I was in New York City with my family for spring break. We had an amazing time and saw as much as we could (and had the tired feet to prove it)!! 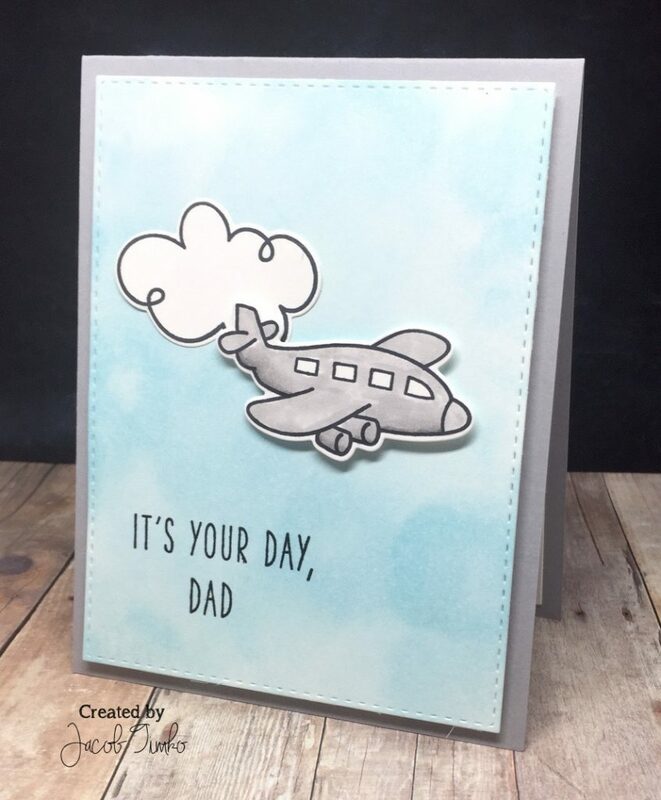 Because of the week off, I was not able to participate in the Stamping for Autism Blog Hop so instead I created my card today with that in mind. I was inspired for my card by this logo. 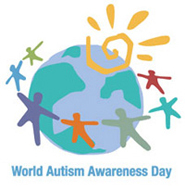 I love how the colors reflect the differences of all those who are on the autism spectrum. Just like a rainbow, the colors are better together! I thought it would be nice to create a wreath of sorts using similar colors and this wonderful flower from Cottage Garden. After stamping and die cutting the flowers, I chose this sentiment from Happy Little Thoughts. It sums up how special each individual is, after all. And on a personal note, I have a number of friends with children on the spectrum. These parents are the most extraordinary kind of parent. They are gentle and kind, yet ferocious when defending their children against misunderstanding. They are full of love and tolerance, yet willing to fight any battle to make sure their children get the most they can from this world. I’m in awe of them and pray that with each post in this week’s hop, there is more kindness and understanding for those who face these challenges every day. 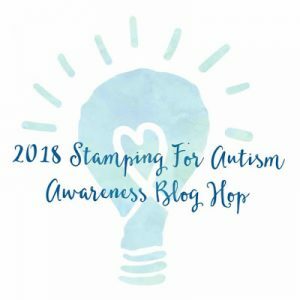 Please take the time to go over to Newton’s Nook Designs for the DT hop and also to see Veronica Zalis who is the creator of the 2018 Stamping for Autism hop (there are chances to win prizes at both too). Thanks for stopping in today. 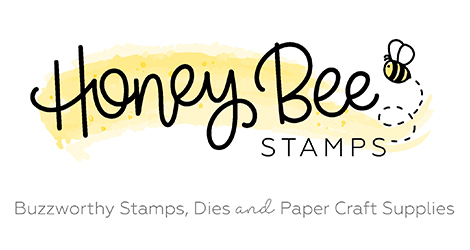 I’m back to stamping and will see you tomorrow for the latest from Freshly Made Sketches. Until then, have a great day! Happy Friday everyone!! I’m thrilled to be here today to help launch a new Rerun Feature and Challenge over at Winnie and Walter. 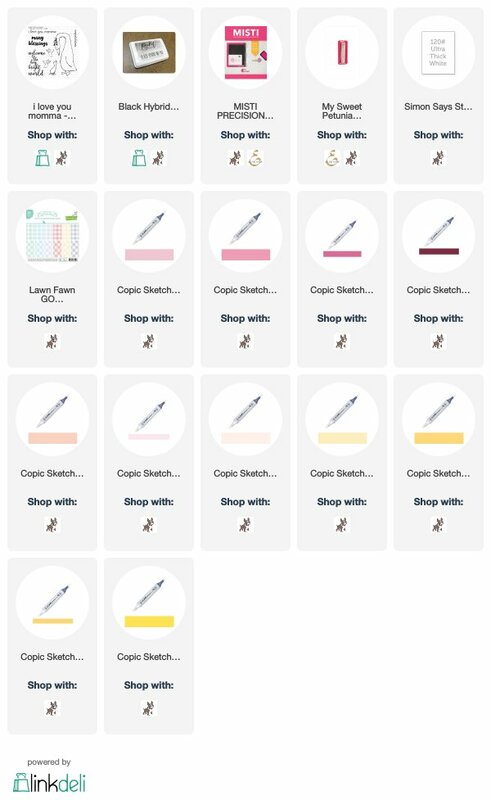 The stamp set for this month is Welcome to the Family with Eveline T Designs. I think this little set is simply precious and I fell in love with the giraffe. 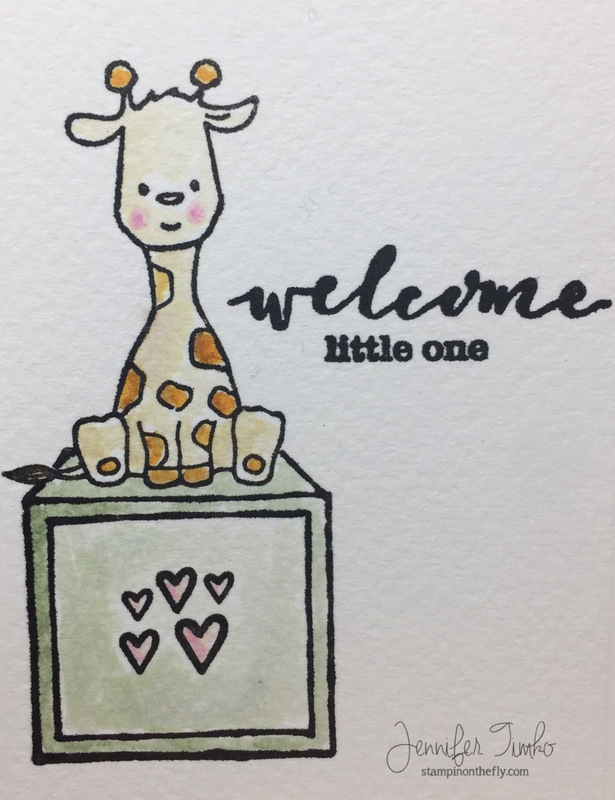 With a baby them in mind, I chose soft Distress Ink Colors and colored this little fellow on Fabriano Watercolor paper. Just a little masking to allow him to sit on the block. I masked the sentiment as well to mix the script with the print….love the flexibility to do that! Once everything was stamped and colored, I cut the image layer and the gingham paper using cross stitched dies. Finally a little black twine for an added detail. 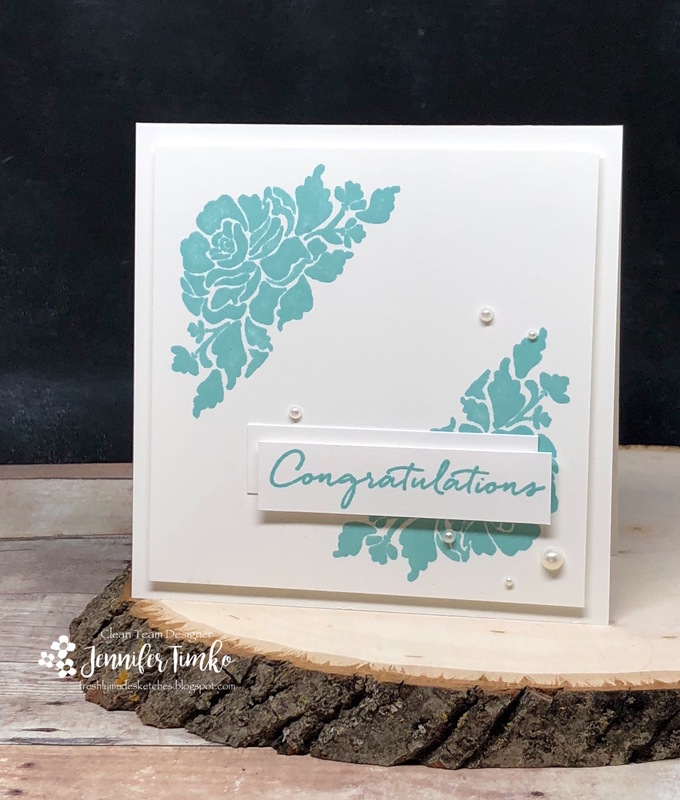 I talked a bit about the Stamping Away retreat that I attended last week in my post from Wednesday and this is another of the sets so generously given to us by Shay of Winnie and Walter. She really is incredible!! And the Rerun has cards created by some of my retreat friends too so make sure to go see them all! I’m also linking this with the Simon Wednesday Challenge where the theme is Girl Power and the focus is on Winnie and Walter stamps. Hope you enjoy my card and that you will be inspired to join in this month! Make sure to go check out the Winnie and Walter blog for all the details! Thanks so much for stopping in. See you soon! 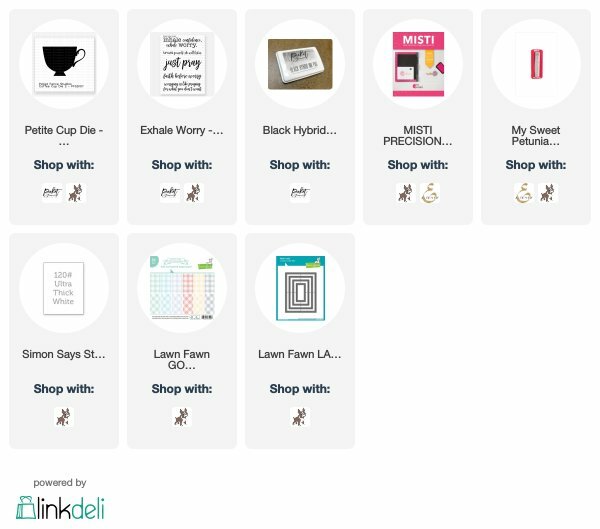 I told you I would have a guest designer on my blog today and it is none other than my oldest son! He created a card for Father’s Day that I just had to share!! (Don’t worry, he approved) He chose the Bon Voyage stamp set and colored it using my T series gray Copics to make it look like dad’s airplane. Cute, right?! Then I showed him how to create a sponged sky using Tim Holtz Distress Ink and the Mini Ink Blending Tool. He created a super cool sky, don’t you think?! 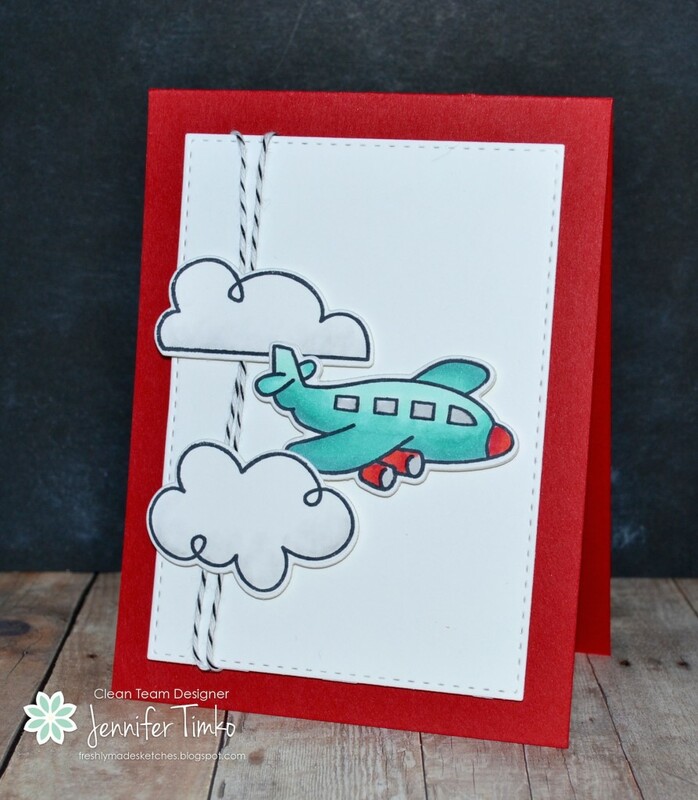 He wanted a cloud too so that was stamped and cut using the coordinating dies (as was the plane). Then he picked a sentiment from the May Paper Pumpkin. I LOVE this sentiment!! In order to get the sentiment just right, he pulled out my trusty Misti to get the perfect alignment and fully inked stamping. Because he just had to have it perfect after all the work on the sky panel! The panel was cut using Stitched Rectangles and popped up on Dimensionals. I think he totally rocked this card!! I’m sure my husband will be totally thrilled. Little brother created his own work of art too (never to be outdone). So they made mom’s day while working to make dad’s day fabulous! I hope that your weekend is lovely! Thanks for dropping in to see my talented guest’s work!! 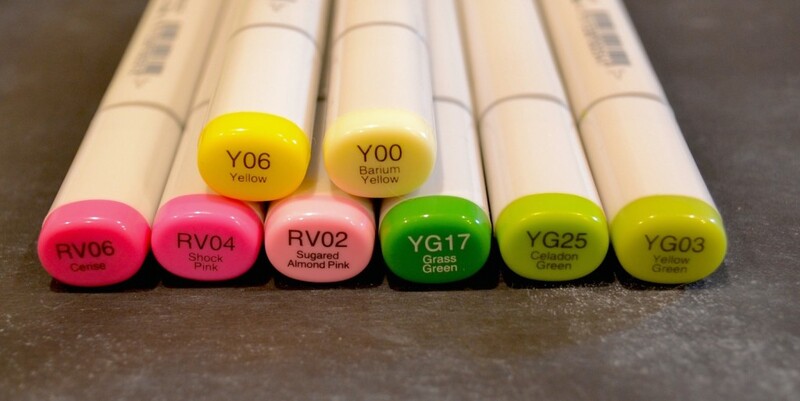 In any case, my friends over at Freshly Made Sketches have a great sketch for jump starting your creativity this week. 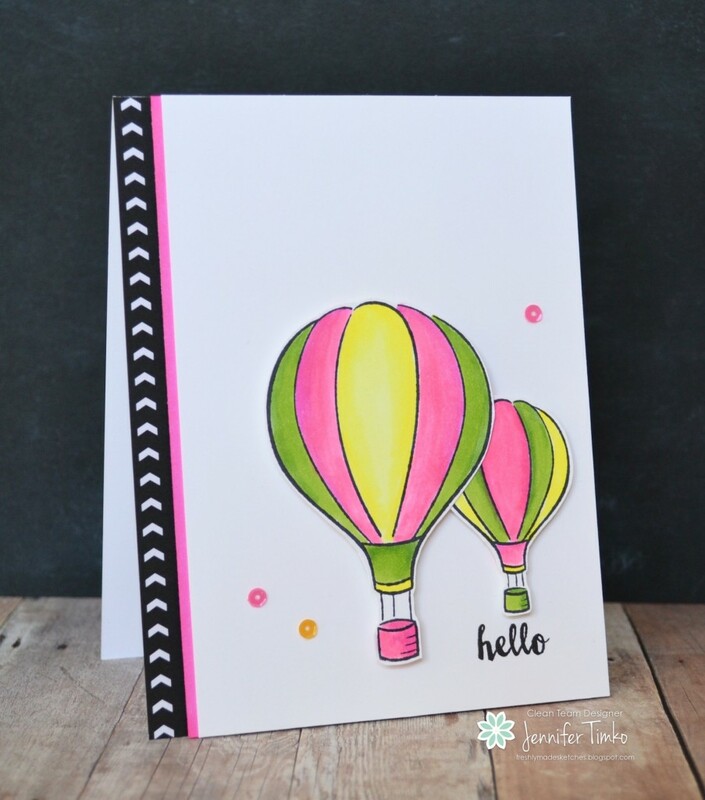 The talented, fabulous and oh so creative Cindy Hall is our sketch hostess this week and her sketch is sure to get you moving right to your stamp room! My card, thankfully, popped right into my head when I saw the sketch. I just got this awesome little plane set called Bon Voyage from Lawn Fawn and I pulled out my Copics to color it. I thought the plane and the clouds were perfect for the set of three on the sketch. Now I have to confess that when I started editing my photo, I thought it looked like something was missing and I realized that I should have included a sentiment. Ah well…I will include a fun one inside instead. I used the coordinating dies for this set to cut out the images with my Big Shot, added some Black Baker’s Twine and attached them all to a panel cut using Stitched Rectangles Dies (SSS). The base of the card is Real Red. Alright…off to get ready to fly into Denver and beyond. Hoping the blizzard there doesn’t cause too much havoc! Make sure you take a look at all the DT’s inspiration this week! Have fun stamping! With this trip and then Easter, I won’t be back until next week. But I have some great ideas that are all ready to hit the paper when I return! Until then, I hope you have a safe and blessed Easter. Wow, is it already Wednesday again?! The last week has just flown by! Literally. Because I have been flying TONS! But at least it is Freshly Made Sketches day. Yay for that!! And the clever and so fabulous Linda Callahan has our sketch all ready for this week and it is awesome. I just got this stamp set called Blue Skies from Lawn Fawn last week and the little balloons called out to be colored for this one. I also got some new Copics so out those came too! Also in the order, Pretty Pink Posh Sequins….yep, I was ready for some spring colors and inspiration for sure! The sentiment on this is from the February Paper Pumpkin, the DSP is retired from SU and the pink strip is a piece of white colored with Copics to match. I know my post is super fast. Long day dealing with weather and another looms for tomorrow. This is a long trip but when I get home, I have some time off so it will be worth it! I hope that you are having a great week. Last week you all blew us away with a super gallery. I’m hoping to see that again this weekend. Make sure you let the team know how much you like their work and give a special note to Linda for our awesome sketch! Happy rest of your week. See you soon!